Welcome! I thought I'd tell you a little bit about me and why I started the Spice-Mixes.com website. 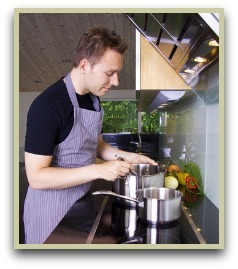 I'm Jason and I am passionate about home cooking, particularly home cooking as organically and naturally as possible. If Mother Nature had intended us to eat this stuff, she would have added chemicals, artificial colourings, preservatives, GMO's and other "ingredients" you find in today's processed food. But she didn't, so that's good enough for me! For me, eating cleanly involves growing and cooking as much food as possible completely from scratch. One easy way I found to limit processed food in your diet is to make your own spice and herb blends and not rely on store-bought brands. There are some nasty ingredients in some of those commercial powders! Growing herbs and spices, harvesting the leaves and seeds before drying and lightly toasting before grinding and combining, is also an enjoyable and worthwhile thing to do. Read more on toasting and grinding. But if you haven't the time or space to grow your own, then just a few whole spices and quality pre-ground powders and you're ready to assemble your own homemade works of art! Click here for more info on what ingredients I recommend. Because I have a ton of tried and trusted recipes, I thought I would share them and that's the reason Spice-Mixes.com came about. Creating your own blends, rubs and mixes is easy and the superior flavours, colours and aromas they add to your recipes are amazing! Anyway enough about me, I hope you enjoy the recipes and the difference I guarantee they will make to your home cooking.